This summer I have a simple, straightforward goal. I’m not trying to lose 50 pounds, or develop six-pack abs, or write the Great American Novel. No, my sights are set much lower, at something that is at least reasonably attainable: I want to wear my sunglasses as often as I possibly can. 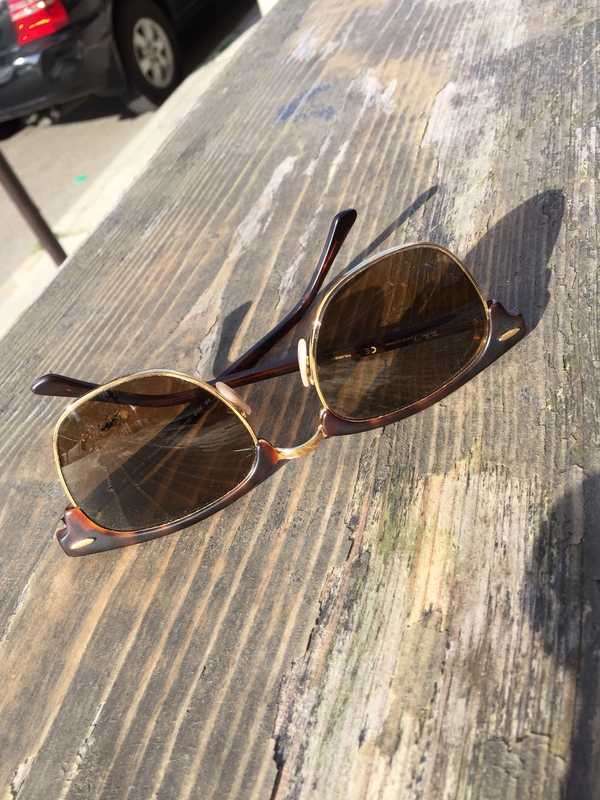 Some years ago, when I bought a new pair of regular glasses, I got this pair of retro sunglasses for a reduced price. However, I’ve never really worn them much. I think it’s because I’ve never gotten in the habit of wearing sunglasses at all. I’ve always worn prescription glasses, and back in the old days if you did your only option was to wear the kind of shades that clipped on to your regular glasses. That was too nerdy for me, so I swore off sunglasses. As a result, even when I got these prescription jobs that address the near-sightedness issue, I just never thought of wearing them. But earlier this year I resolved that I should start wearing the sunglasses, and I’ve realized I really like it. For one things, the dark lenses hide the unseemly bags and wrinkles surrounding my aging eyes. For another, the sunglasses make me think I look stylish, even if that is a laughable proposition. And wearing the sunglasses on hot days somehow makes me feel cooler, temperature-wise. I know that can’t possibly be true in an objective sense, because obviously eyewear doesn’t reduce the ambient temperature or minimize the harshness of the sun’s rays, but wearing the shades gives me that feeling just the same — and I like it. Already this year, I’m confident that I’ve worn my sunglasses more than I have in all of the years I’ve had them, combined. I feel a certain sense of accomplishment, but I also feel like I’m in more of a summer mood. Amazing what a pair of sunglasses can accomplish! It’s been beastly hot in Columbus over the past few weeks, with temperatures in the 90s and very little rain. You might aptly describe the weather as broiling — but that’s July in Ohio for you. We’ve been gone for a few days during this torrid period. That’s been good for us, because we were enjoying much cooler weather, but for the plants in our front flower pots? Not so much. When I got home they were dried out and teetering on the edge of death. I’ve been watering them in the morning and again at night in hopes of saving them and am seeing some hopeful green signs, but it’s obvious the hot weather combined with lack of watering knocked them for a severe loop. The flowers and plants in our beds, on the other hand, seem to have survived the hot dry weather just fine. It makes me question whether having flower pots during a midwestern summer makes any sense at all — unless you are going to be around on a daily basis to water them. Since we’re on the road regularly, I’m thinking that next year we might forgo the cruelty to the poor potted plants and the guilt that comes from seeing desiccated brown leaves.